"What are you narrating your own life now?" How will you cope in the apocalypse? Will you have a sporty, survivor look? A faithful pet companion? Maybe all of the above and then some? 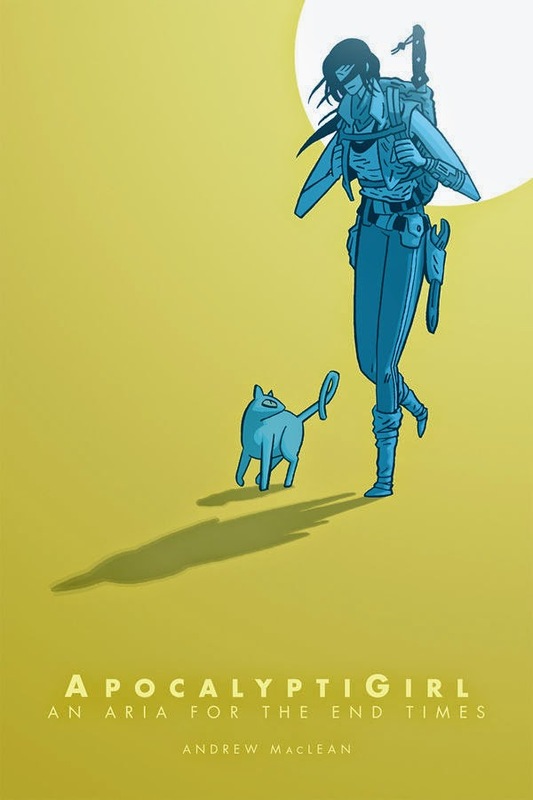 Apocalyptigirl: An Aria for End Times TPB Dark Horse Comics features a brazen hero with a pet cat and a lot of confidence. The book is written and illustrated by Andrew MacLean. Alone at the end of the world, Aria is a woman with a mission! As she traipses through an overgrown city with a cat named Jelly Beans, Aria is on a fruitless search for an ancient relic with immeasurable power. But when a creepy savage sets her on a path to complete her quest, she’ll face death in the hopes of claiming her prize. The isolation that comes with an apocalypse is often one of--if not the--scariest aspects of surviving in a world without rules. Encountering other survivors is always a crapshoot, as you'd entirely unsure if they're out to get you or help you and that's what MacLean captures so well in Apocalyptigirl: An Aria for End Times TPB. Most of the book features Aria carrying on conversations with herself that range from vocalizing an inner monologue to purely sanity checks. MacLean's approach is fascinating adds an additional level of loneliness to the book, but it also provides an interesting format for telling the story. Capturing her trials from her point of view gives the reader extremely limited insight into what's going to happen next, as MacLean capitalizes on that suspense to carry a fast-paced tale that demands the reader's full attention. MacLean's artwork is equally as compelling as the story. John Arcudi refers to his art as "one of the most boldly original visions in comics" and he's not that far off--MacLean style blends characters into background settings fluidly and naturally. Aria is easily believable as an intrepid survivor and explorer, boasting a look that blends a rounder face with sharp angles for her limbs. The colors used appear washed out--saved for splashes of red blood--that underscore the somewhat dire nature of the world Aria lives in. And the panels are laid out rather conservatively in a typical grid format, the amount of panels on each page range from one to many, all of which are accented by empty gutters. Apocalyptigirl: An Aria for End Times TPB is a captivating book that instills a fear of survival in the reader that just so happens to be shared by the main character. Life isn't easy for Aria, despite how much she would like to be, but that doesn't stop her from waking up every day and making her way in the world. MacLean's storytelling is impressive and captures the readers imagination in a way that taps into an innate curiosity and inability to guess what's going to happen next. His art is up to the task of breathing life into the world he's created, as Aria traverses jungles and abandoned cities that rival in the amount of danger. Apocalyptigirl: An Aria for End Times TPB is definitely a worthwhile pick-up and a great read. Apocalyptigirl: An Aria for End Times TPB is available in stores May 20.